This research presents a comprehensive analysis of the design and validation of a cross-flow microfiltration device for separation of microspheres based on size. Simulation results showed that pillar size, pillar shape, incorporation of back-flow preventers, and rounding of pillar layouts affected flow patterns in a cross-flow microfiltration device. Simulation results suggest that larger pillar sizes reduce filtration capacity by decreasing the density of microfiltration gaps in the device. Therefore, 10 μm rather than 20 μm diameter pillars were incorporated in the device. Fluid flow was not greatly affected when comparing circular, octagonal, and hexagonal pillars. However, side-channel fluid velocities decreased when using triangular and square pillars. The lengths of back-flow prevention walls were optimized to completely prevent back flow without inhibiting filtration ability. A trade-off was observed in the designs of the pillar layouts; while rounding the pillars layout in the channels bends eliminated stagnation areas, the design also decreased side-channel fluid velocity compared to the right-angle layout. Experimental separation efficiency was tested using polydimethylsiloxane (PDMS) and silicon microfluidic devices with microspheres simulating white and red blood cells. Efficiencies for separation of small microspheres to the side channels ranged from 73 to 75%. 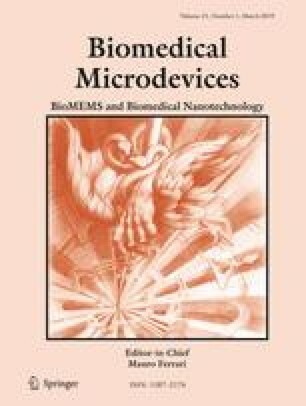 The silicon devices retained the large microspheres in the main channel with efficiencies between 95 and 100%, but these efficiencies were lower with PDMS devices and were affected by sphere concentration. Additionally, PDMS devices resulted in greater agglomeration of spheres when compared to silicon devices. PDMS devices, however, were easier and less expensive to fabricate. Thanks to Dr. Hongwei Sun for the use his equipment at UMass Lowell, and Hamed Esmailzadeh Khosravieh, Junwei Su, and Che-Fu Su for their assistance with that equipment.